In my last article on Hexarelin, we went over a list that described the strongest to mildest GHRP’s available. Hexarelin came in at the top spot as the most potent GHRP, but it also touted high side effects and quick desensitization. The other end of the spectrum is Ipamorelin – the mildest GHRP. But don’t let its mild characteristics fool you, this pentapeptide can be used to spur a very large GH pulse that produces the least amount of side effects. 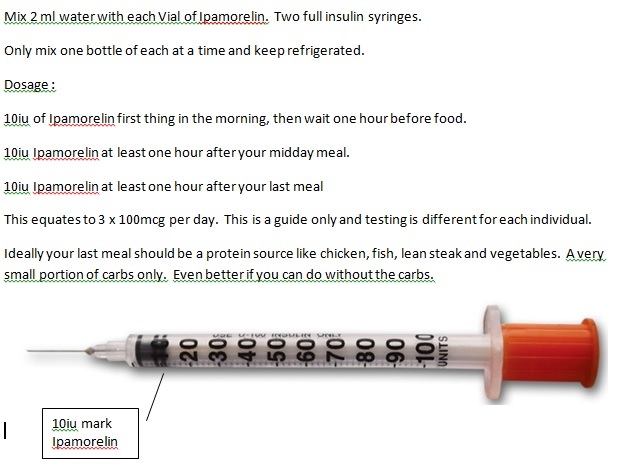 Ipamorelin can easily be ran at 1200 mcg a day without breaching desensitization levels. Studies have shown that large saturation doses of Ipamorelin had almost no effect on the body’s natural GH production. This is ideal for athletes or bodybuilders concerned with shutting down their body’s natural GH production. Looking at Ipamorelin functions, it can be said that it is similar to GHRP-6 in the way of increasing ghrelin and gastric motility, as well as, targeting a selective GH pulse. Though, the hunger sides on Ipamorelin are virtually zero. This makes it a much more versatile peptide for before-bed time dosing. Unlike GHRP-6 and GHRP-2, Ipamorelin was shown at high doses to have almost no direct impact on cortisol or prolactin production. This means users can dose higher and with greater frequency without having to be worried about cortisol and acetylcholine blood plasma levels being elevated. In short, it may be the mildest GHRP, but it is in no way the weakest. In fact, as a GHRP, it has shown to be one of longest lasting, and, at higher doses, the most potent. Ipamorelin function is a slow building one that is much more like the body’s natural growth hormone (GH) release. This makes it the healthiest choice in the bunch! After an athlete administers Ipamorelin, a selective pulse is sent that stimulates the hypothalamus/pituitary to release GH. This pulse can endure for approximately three hours after injection. Once the GH pulse is sent, the cells go directly to the muscle to support development while staying clear of any possible bone or cartilage growth. This is good for Ipamorelin users, as long term usage will affect lean body muscle growth without the possibility of experiencing any bone or cartilage deformities. The same cannot be said for synthetic HGH users, who experience pronounced side effect in swelling joints and even in some cases Carpel Tunnel. Ipamorelin will increase cell synthesis, elevate secretion levels of insulin from pancreatic tissue, and increase ghrelin in the stomach – which helps release GH and control hunger. All of these functions work to promote fat loss, shuttling of nutrients, and building clean muscle mass.